First and foremost you should diagnose what might be causing charging problems in your phone. Sometimes when your mobile phone’s battery gets too low it does not pick up charging at once, you have to keep the charger plugged in the phone and wait for a few minutes for the battery to pick up the charging process. Check and replace the battery Charger. Check and replace the phone’s battery. A fully drained battery won’t charge up. Check/clean or replace the charging jack connector and the PCB pads. Trace the charging Ways Marked in below image. If any of track ways is missing just make a jumper with jumper wire. 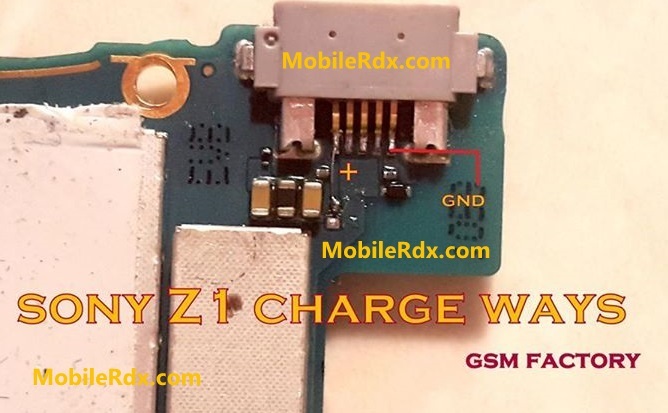 Sony Z1 Charging Solution,Sony Z1 Not Charging Problem,Charging Ways,Charging Jumper.